Bismillah. In the name of Allah. I have dragged myself here to blog about this important, life-changing milestone that is the birth of our second son! I really wish to have this written down and documented just like Nu’man’s birth story — otherwise I know I would forget the details. The account below is quite personal and particular, but I hope there is still benefit to the reader, inshaAllah. lots of aches and discomfort in third trimester: difficulty sitting, lying down, sleeping. At seven months I already felt huge! didn’t walk as much as I did during first pregnancy, because too achey! I re-read my e-book of Ina May Gaskin’s Guide to Childbirth. Great birth stories and insights from the midwifery model of care in the US. I borrowed a new book, The Birth Partner by Penny Simkin from a dear neighbour (thank you Kak As! ). It’s amazingly comprehensive and really brings home the point on the mother’s state of well-being being central to the entire birthing process. I also appreciated how the author understands that different mothers handle labour differently, and that the reader should feel comfortable relying on and trusting themselves! I also read the AMANI Birth book out of curiosity, as I know it is “the other” popular antenatal course around and has some Islamic integration within its modules. However, I find the book leaning towards a personal slant in terms of the author’s own experiences and biases. If one would choose just one general guide as a first-time parent I would recommend Ina May’s book above. Alhamdulillah we also made it to a HypnoBirthing refresher class with our old instructor, dearest Ayuni. Totally loved reliving the HypnoBirth scripts, sharing experiences of the first labour and practicing the various techniques again. I have been attending check-ups at our local KK (Klinik Kesihatan) throughout pregnancy and did not have the opportunity to set any appointments at the previous hospital that I gave birth in since we live four hours away now. At 37 weeks, I decided to meet Dr Zana Zalinda of Tunku Azizah Women & Children’s Hospital (now known as Rampai Puteri Medical Centre, funny story on this below ) after positive recommendations from friends and the Gentle Birthing Group. The hospital is a stone’s throw from my in-laws’ house and my brother’s apartment, but an hour away from mum’s place which I’ve been staying at since week 36 of pregnancy. Nevertheless, Dr. was lovely and so understanding of our birth plan, and I have heard of others who live just as far but delivered with Dr. Linda too so I figured it’s worth it inshaAllah! Nu’man was born at 39 weeks on the dot, so naturally we hoped and wished that Baby#2 would have similar timing. The three of us: Abi, Nu’man and I have been enjoying the comforts of TokMa’s (my Mama’s) home for the long holiday; 39 weeks would be just after Eid ul Adha — alhamdulillah I got to enjoy various Raya delicacies and miscellaneous desserts — and Abi can simply extend the work break with his 5-day paternity leave. 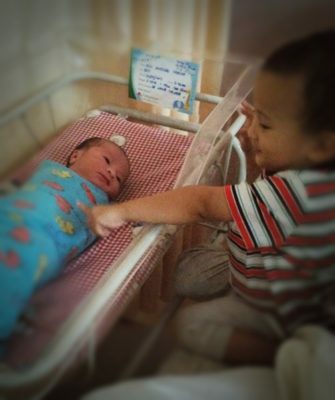 SubhanAllah, little did we know Baby#2 would be just as obedient as Abang Nu’man! On Monday 4 September 2017, I was woken up at 1am from some physical discomfort. I was actually reluctant to get off the bed at first but went to the bathroom anyway with much heavy feeling all around. Looked into the bowl and it seemed a bit pinkish, I thought. Put on a pantyliner and fresh underwear. Realised a minute later that a pantyliner wouldn’t do — warm liquid kept coming out so switched to a huge pad. I remembered complaining to Abi just before sleeping that night, “[on my aches] It hurts everywhere, I don’t want to be pregnant anymore…!” “. Then I settled myself next to the bed on a bean bag, transferred HypnoBirthing scripts into Abi’s phone because I just realised my phone can’t take earphones (the toddler managed to stick something into the audio jack and broke it in there! ). I downloaded a contraction timer too after I realised this is it! The surges were about 50 seconds long every 4 minutes (tracked for half an hour). By 3am I already transferred myself to the gym ball from the bean bag. The surges were getting to my thighs, which made me decide to wake Abi up. Prior to this, in between surges I tried to complete packing up the hospital bag using the same paper checklists I’ve recycled from two years ago! I figured I better do what I could when I could, otherwise I’ll have to rely on giving instructions to the husband (which — let’s face it ladies — we would rather not). Abi woke up properly and we figured out our method of riding the surges: me sitting on gym ball, facing Abi sitting on the bean bag. I would say, “Coming!” to indicate the start of a surge. He starts the timer app then promptly does what Ina May says is chunging — vigorously massaging/shaking/kneading/pounding parts of the labouring mother’s body — in my case, my thighs. I would try my best to do surge breathing (breathing in deeply towards your abdomen) and bury my head into Abi’s left shoulder. When the surge was over, packing would resume. At some point our toddler woke up. We spoke to him and gave him cookies (he always asks for cookies upon waking up in the morning). Abi would not let me peek at the timer app at all, but I knew from his mannerisms that he was on the verge of panic/worry and my many random thoughts and instructions were not quite helping. (Spoiler: surges were 2-3 minutes apart, and less than one minute long.) I remembered scolding him too for putting my phone in Nu’man’s diaper bag, “Why would you do that? We’re not bringing that bag, just the black bag and purple suitcase!”, “Don’t make me mad Abi, please!“. Haha, I feel slightly bad now but I was just so convinced that keeping a labouring mum’s emotions in check is critical, so I wanted to drill this point in! I also told him after that, “Number one rule Abi, don’t leave me!” because in my last labour I was left alone in a four-bedded ward as he was not allowed to stay overnight in a shared ward. Sometime between surges I managed to change into a comfortable jubah, kain dalam, and got my instant tudung ready. I don’t remember the timing of things, but at some point I also prepared an empty plastic bag in my pocket as a barf bag. And guess what? I had to use it, just as I vomited in my last labour too! Before that I only had a few bites of a peanut butter sandwich husband quickly packed in a Tupperware (with a few dates, but they were left untouched). It was only after 4am that packing was as complete as we could manage, and husband urged that it was time to go. My initial thoughts earlier was to wait for Subuh or something, but with the driving distance, both of us knew the timing of the surges wouldn’t allow us to wait much longer. I assured her “I OK je” (while still bouncing on gym ball on the upstairs landing), bid goodbye and went on our way (almost — still had to stop and bounce at the front door for a few surges). I reclined the passenger chair quite a bit (actually I kept having to do this in my final weeks of pregnancy: sitting upright has been highly uncomfortable!). Closed my eyes most of the time but managed to peek and witness us running a few red lights! Asked Abi to recite Qur’an, he finished Al-Kahf and An-Naba’ from memory, and a few more surahs but those are the ones I remember. Surges were intense and overlapping — my vocalising was increasing in frequency and volume! “Huuuuu, huuuu“, I would say while exhaling, “Ya Allah“, “Astaghfirullah“, anything that helped. A few surges towards the end were just unbearable and my whole body flailed violently. It must have been in the car that the thoughts came — of a quote I read of a labouring mum who had an epidural. Her husband said she seemed to be sleeping, nobody could even tell she was in labour. I was utterly jealous! I remember that I prayed the labour would slow down in the car ride, “Oh Allah please give me a break”, but that didn’t happen at all. Funny point as we reached the hospital — the name on the signboard was different! Logo and colours seemed similar enough, but there was no mistaking the name change. Husband asked if this was the one (he has never been to the hospital, but I pointed it out to him as we drove by to my brother’s place the week before). The location was accurate though so we thought, this must be it. Even after the car was parked outside A&E, I wouldn’t let my husband leave me. The surges were still rushing on, “jap je, japppp!”, I would beg. Husband flashed the car lights. I remember a man (possibly staff) exiting the hospital door, then husband lowered my window and called him over. I remember saying the word “emergency” with my half-closed eyes. The nurse from the counter asked me some questions — “Dah berapa minggu?” “Thirty-nine”, “Check-up dengan doktor mana?” “Dr Linda”, “Ada bawak kad appointment?” “Ada dalam beg hitam” (not even knowing if my husband was behind me to act upon this information). And something about water breaking then I said leaking at 1am. “Tarik nafas Puan“, she managed to advise. I was wheeled a short distance to one of the curtained stations which had two beds and various equipments. Don’t know how I managed to get up on the bed (needless to say, state of sanity is very fuzzy at this stage of labour ). They removed my underwear, did a VE and I swear I heard, “Baru 8cm” (“baru“?!?! ), then I heard husband’s voice, “Dah agak dah” (ehh pandai pulak dia agak-agak ye). Doctor was not there yet. We only messaged her number as we left home and the hospital called her when we arrived. Constantly sensing “paper” in between my legs, which turned out to be a nurse’s gloved hand. I wasn’t at all aware of where/how many staff there were. Urge to poop becoming stronger with surges. I first felt it on the bed downstairs. I said, “Rasa nak berak!” a few times, one time a nurse simply replied, “Ha, beraklah“. Other times a nurse said, “Puan bukak mulut, bukak mulut” (I assume to make sure I breathe through the surges and/or not strain). Thennn, the burning started. The feeling was SO significant in this labour, it was right between the legs. I yelled “burninggg!” at least a couple of times. The final time the burning sensation happened, my instinct just made me turn on my back from my side, and next thing I knew: the head was out! I felt baby still coming out but then heard, “Kena potong ni“. I wondered if they meant cutting me (ie. an episiotomy) but was already completely redha with anything at this point. There were stuff going on down there and I didn’t know what to think. Next I heard baby’s cry and there he was on my chest! SubhanAllah! He was very vernix-y and had a chubby face. Husband recited azan into his ear. “He’s definitely a boy,” Abi also said. I was so surprised yet glad that it was over, so quickly! Apparently it was only 5:45am, not even Subuh time. Baby didn’t seem to want to breastfeed just yet and nurse suggested they wipe him and clean out his phlegm. They also weighed him: 3.05kg, very similar to Nu’man’s birth weight. Baby was a metre away from me on the warmer with Abi watching next to him when the doctor arrived. We got scolded for not calling her that morning! “Orang tua macam saya, mana check mesej pukul 4 pagi…” Afterwards there were the usual events of expelling placenta (I was given medication for this) and checking whether stitches were needed (I had first-degree tear and yes). Doctor also massaged my tummy afterwards to expel blood clots — I didn’t experience this in my first labour — it was slightly uncomfortable but I appreciated it as I remembered that it took quite long for my lochia to stop after my first delivery. Alhamdulillah is all I can say. I am so glad everything went well despite not having the doctor right at the birth. Things just immediately went their way, like it occurred to me later that I even had no hand on what position to birth in. I was so taken aback at how quickly it escalated this time around, in my head I would’ve guessed that maybe I’d give birth at 8am, comparing with the first time when I went to hospital at midnight and only delivered at 11:20am the next day. Little did I know it would be an express route this time! Hospital room — a single-bedded ward — was lovely, staff were uber polite, food was generous and the charges were also good (not to mention lower than the rates for Nu’man’s hospital two years ago). The three of us stayed in the hospital overnight (mostly because it was paid for in the package) and came home the next afternoon. Siblings on both sides of the family came to visit. Nu’man came too with my mum and though he was a bit indifferent to the new sibling at first, he warmed up just shortly after. Aww. Baby has been sleeping most of the time, in fact he is still a heavy sleeper at Day 4 due to jaundice (Abi brought him to the clinic today to get a reading). Alhamdulillah for another beautiful birth and for all His Mercy and Blessings. I pray for good health and smooth adjustment period for the whole family. Keep us in your prayers too inshaAllah, the road of parenthood is a mighty long adventure! Such a beautiful birth journey you had Aneesah, hoping mine would be as smooth as yours too. Mabrouk, alfu mabrouk Aneesah, Zakwan and Abg Nu’man! Alhamdulillah. ..felt like a dream. I went to bed with no indication that labour was on the way and woke up in the morning with a newborn baby picture of my second grandson on my whatsapp. All with the mercy from the Almighty. Congrats Aneesah & Zakwan. Both of you have done a super job. I am the only grandparent around at this time around. Tok Abah is travelling for work and Zakwan’s parents are still in Mekah for hajj.